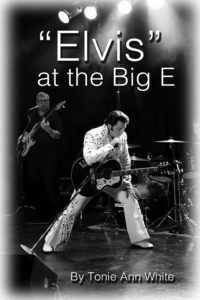 Last year we scanned The Big E entertainer list online and discovered that A-Ray of Elvis was performing on Saturday afternoon. We saw Ray Guillemette Jr. do his impersonation of Elvis the previous summer at the Agawam Summerfest Concert series and we both loved the show. Ray’s been at it for twenty-five years now and he is superb. We wanted to see him again so we made sure we got there early to get a good seat. We chose our spot in the outdoor theater in front of The Coliseum. As we sat there, “people watching,” the long yellow benches began to fill up around us. I noticed a man pass by with a very purposeful walk who appeared to be searching for someone up towards the front of the seats. He had thick, silver, curly hair and a silver dangling earring that caught the sun as he walked. Next thing I knew, this same man had come back towards us and was climbing over the people to my right. He took the open space next to me. The show began. “Elvis” was his usual funny self. My husband and I bumped shoulders as we smilingly jiggled in our laughter. 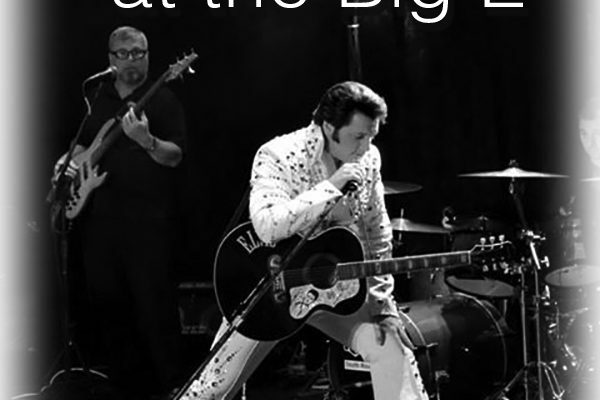 We would look at each other with pleasure, enjoying the antics of “Elvis.” In the midst of loudly laughing, I casually looked over at the stranger to my right to see if he too was enjoying the show. Turning in my direction, he quietly commented, “He’s a comedian.” I silently nodded, “Yes!” “Elvis continued to sing and joke. Then, as he was leading into “Bridge over Troubled Water,” I turned to the man with the dangling dragonfly earring and quickly said, “When we saw this guy last summer, he told us that Simon and Garfunkel believe that Elvis sang this song the way it was meant to be sung.” The man nodded. “Elvis” sang. We listened. I heard the stranger exhale the word “Powerful.” at the close of the song. Wrapping up the concert, “Elvis” sang “How Great Thou Art” which thrilled my soul, for hymns are the songs of the soul set free. “Elvis” ended with one more song and then the crowd stood up. The stranger turned to me and without a word, handed me a gospel tract. I quickly scanned the big blue word JESUS on it and I said, “You have Jesus? I have Jesus! Do you want this back?” “No,” he quietly answered, “I have more.” I said, “See you in Heaven.” as he turned on his heel and sped off into the crowd with that purposeful, searching gait which I had noticed in him before the concert began. When I got home, I pulled the gospel tract out of my bag and read it. It was the first tract anyone had ever given to me at The Big E. The words on the cover were the name of an old hymn called “What a Friend We Have in Jesus,” a song I have known for most of my life. I opened the tract and it spelled out lines of the hymn and backed each line with Bible verses underneath it. Now this is where it got real personal. Only God and I knew that a couple months ago I had taken out my old, worn “Great Hymns of the Faith” hymnal. This is the book that I sang morning circle songs from for years with my little students in the Christian school where I taught. Recently our pastor gave a sermon about the importance of song in our worship of God. That spurred me on to refresh my mind with my old favorite hymns. So, page by page, I placed sticky notes on each one of my favorites. It just so happens that I have forty-nine favorite hymns in that hymnal! Even more significant is that, I had written “What a Friend We Have in Jesus” at the top of the sticky note on just that song so I could easily find it. That’s the song I had decided to try and sing each morning after my prayer time to hopefully relearn the words. Now there are zillions of hymns out there and zillions of tracts too. It was truly amazing that as I was surrounded by thousands of people I was handed the tract that contained the very song I was focusing on each morning! The week before I went to The Big E, I saw a quote on a friend’s refrigerator. I liked it so much that I copied it: “Coincidences are little miracles in which God chooses to remain anonymous.” Some may explain this as a mere coincidence. I believe that it falls in the “little miracle” category which I personally call a “God appointment.” Unless the stranger was an angel in a t-shirt and cargo shorts, the guy probably didn’t know I had something going with the hymn in his tract. Whether he was angel or man, he did what he was directed to do by the One who sent him. God’s message to each and every one of us has always been of His awesome and intimate love for us. Sometimes He chooses to grab our attention in the most amazing ways to remind us of the fact that He knows exactly where we are at and that He see us even when we are in the midst of thousands of people at The Big E!